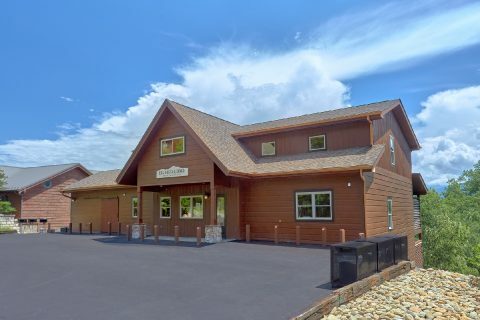 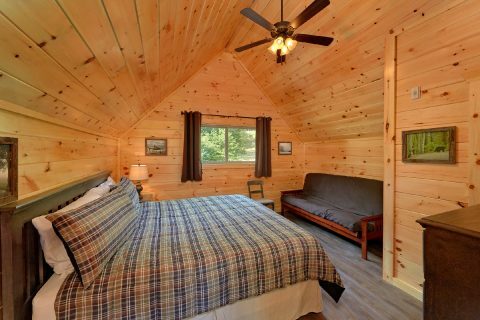 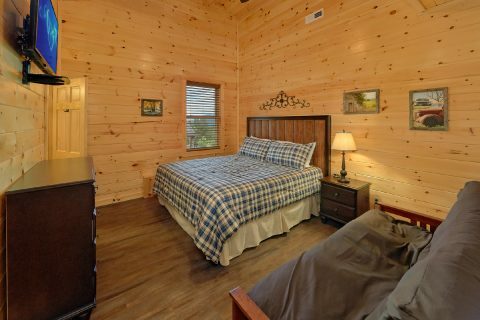 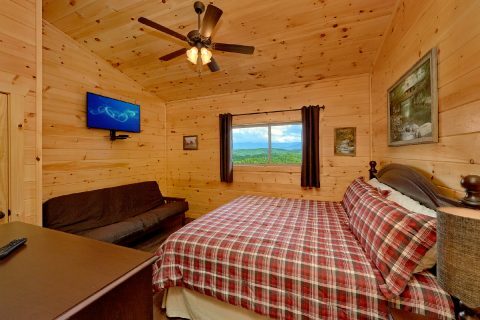 Nestled in the scenic Upper Middle Creek road area of the Smokies, you'll find "Big Vista Lodge," a stunning group cabin with room for up to 64 guests! 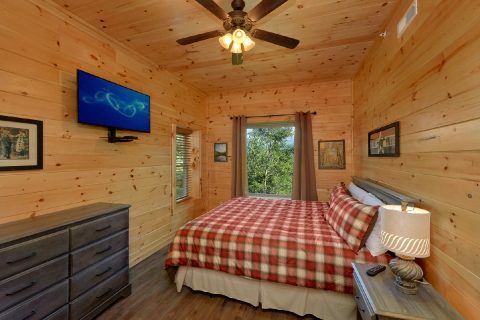 As a result, this luxury cabin is ideal for big gatherings, family reunions, events, traveling sports teams, and church retreats! 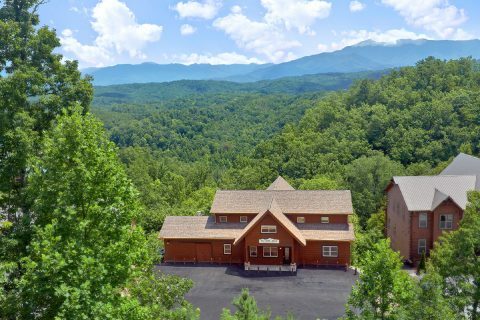 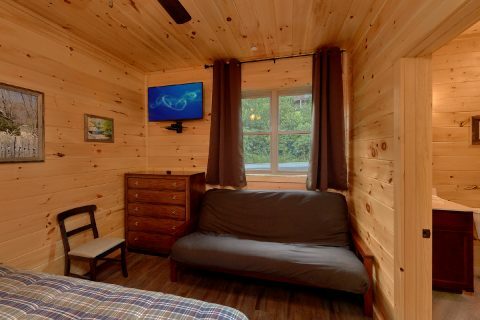 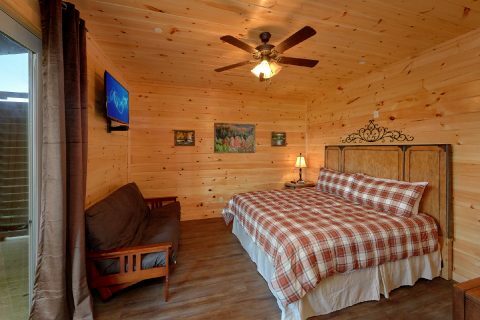 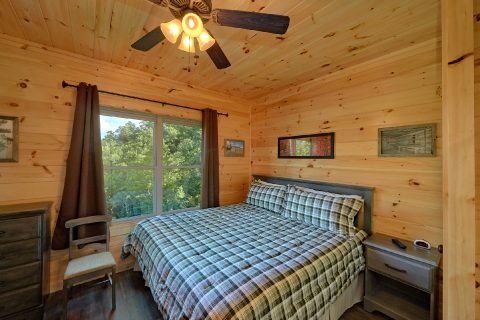 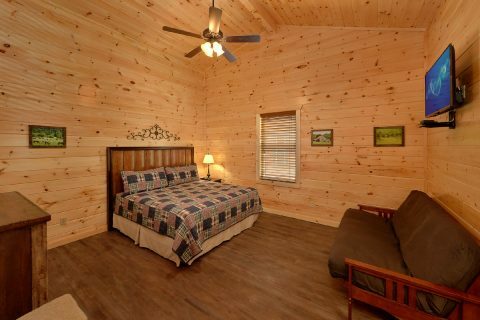 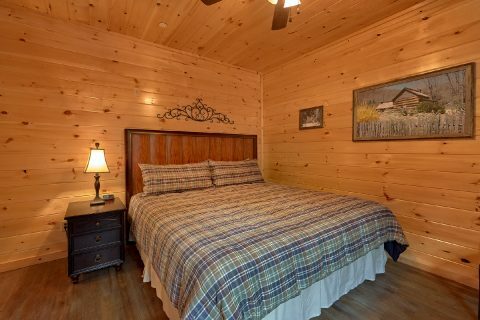 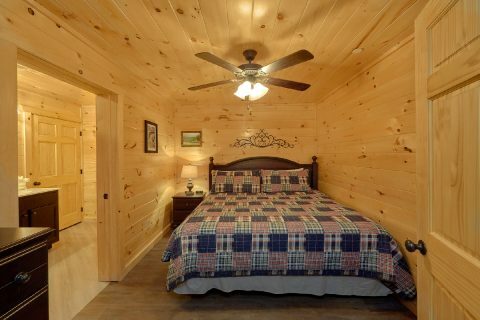 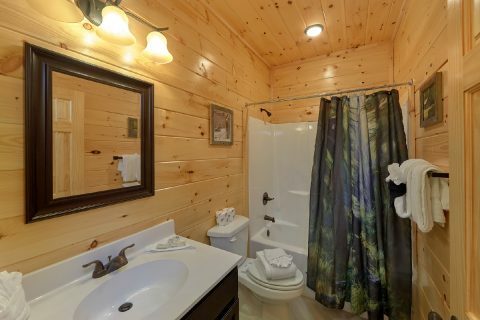 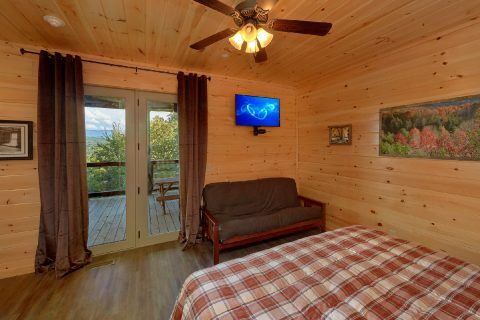 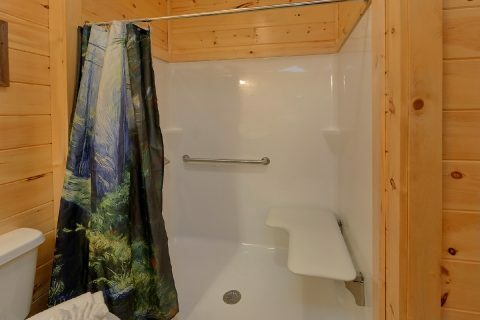 With a great location that's less than 5 miles from Downtown Pigeon Forge and less than 9 miles from Downtown Gatlinburg, this expansive cabin keeps you close to the sights you want to see! 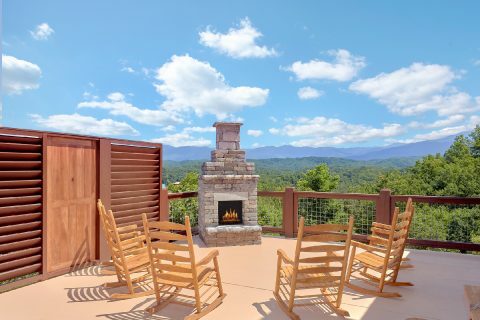 Whether you want to enjoy the thrilling coasts of Dollywood, check out fun dinner shows on the Pigeon Forge Parkway, or hike to gorgeous waterfalls in the national park, "Big Vista Lodge" is only minutes away. 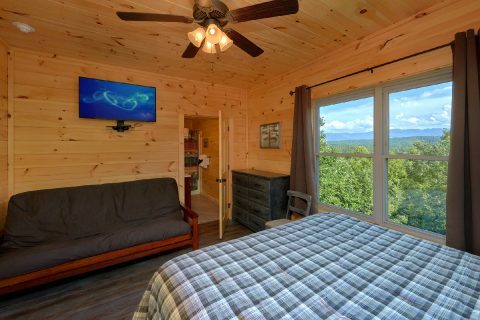 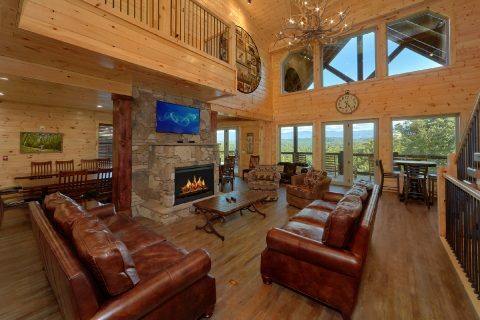 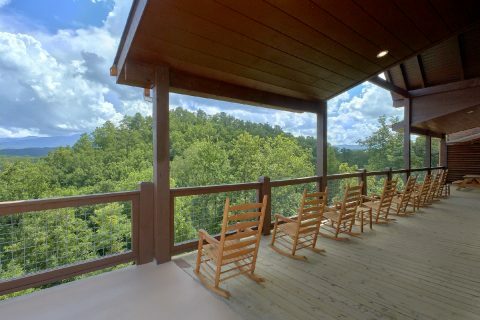 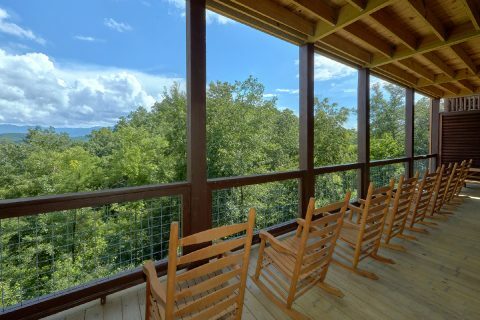 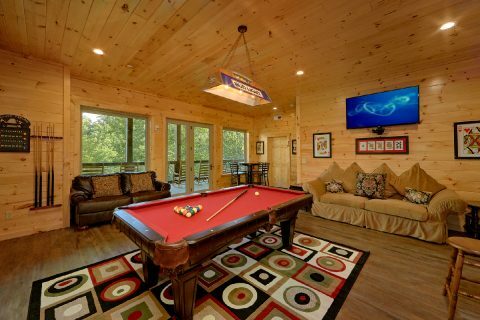 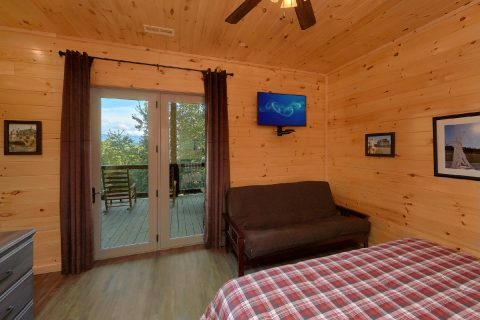 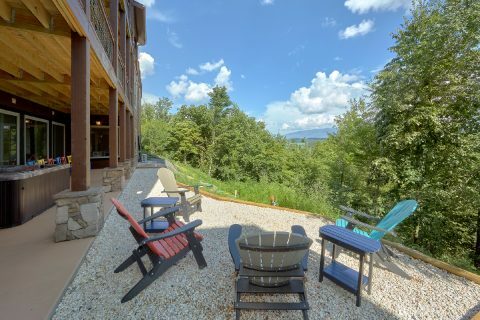 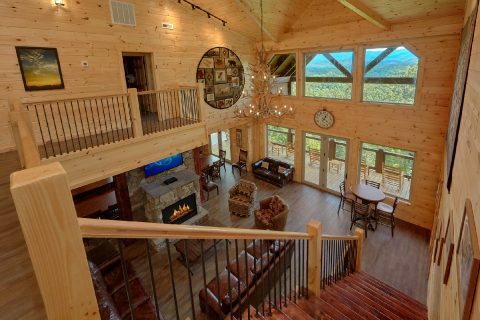 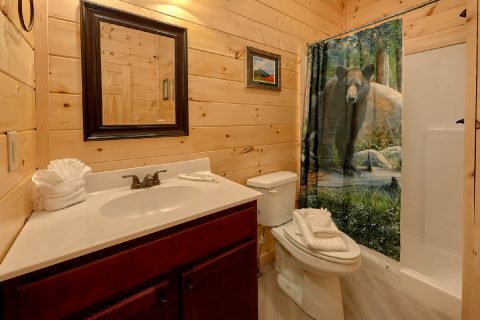 Better yet, this cabin offers an excellent mountain view that showcases the beauty of the Smokies. 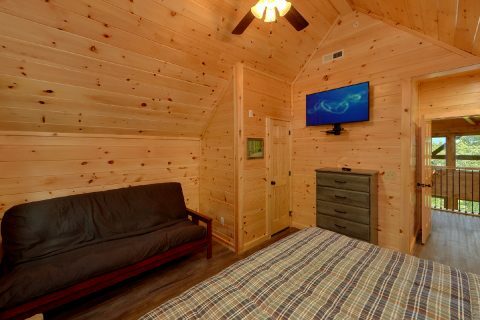 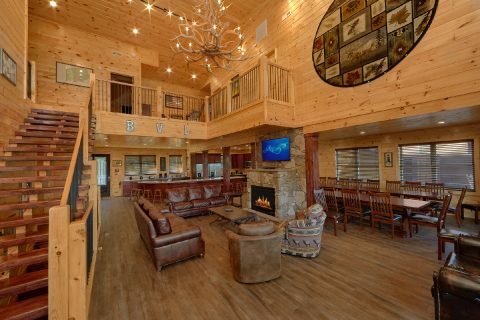 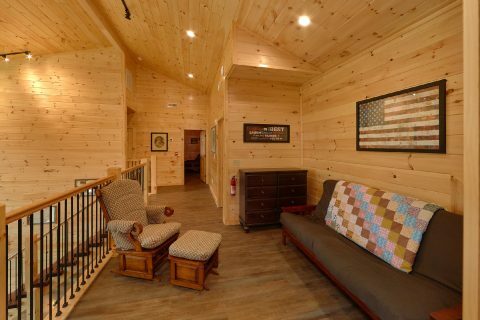 Step inside this extra large cabin and you'll find a welcoming living room area with plush furniture, large picture windows, cathedral ceilings, and an electric fireplace with a television above the mantel. 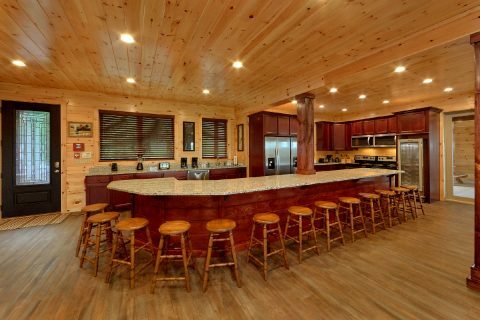 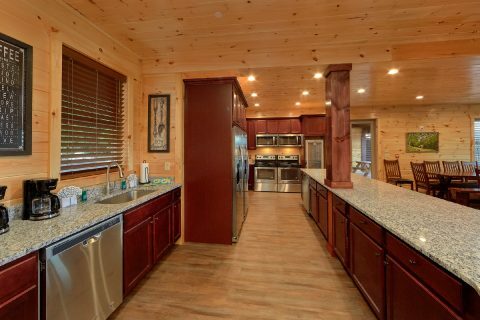 For feeding your large group, this cabin comes complete with a full kitchen with a double stove, two dishwashers, and two refrigerators, so you can enjoy delicious meals in the comfort of your cabin. 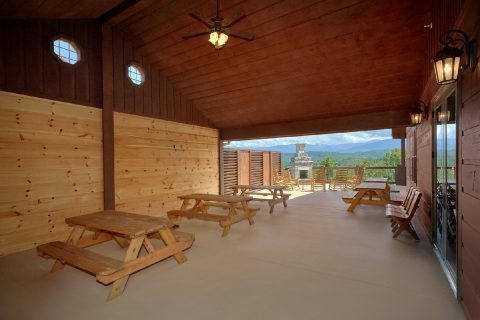 The dining area even comes with a television on the backside of the living room fireplace. 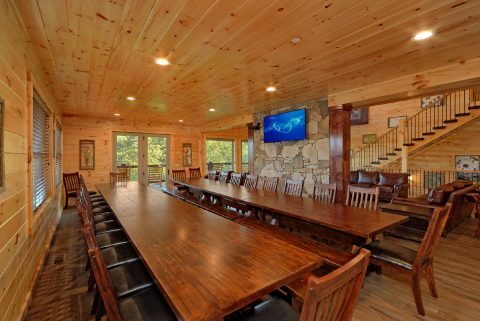 With large dining room tables, this cabin has plenty of dining space for guests! 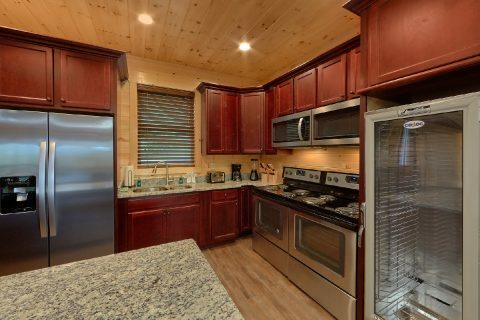 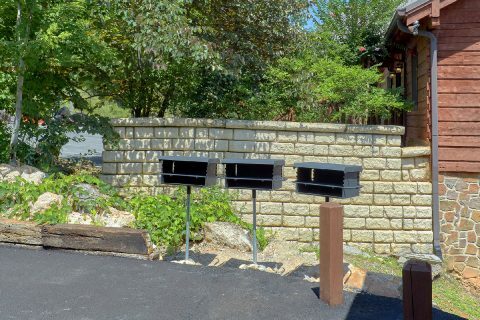 This rental also provides a charcoal grill and an outdoor fire pit area so you can enjoy a relaxing cookout during your stay. 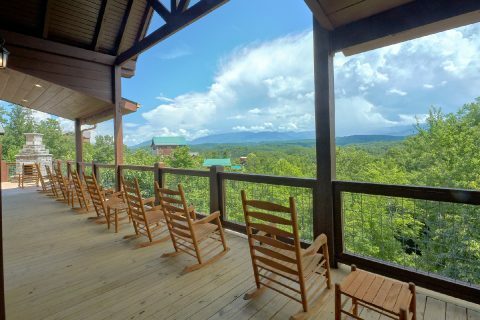 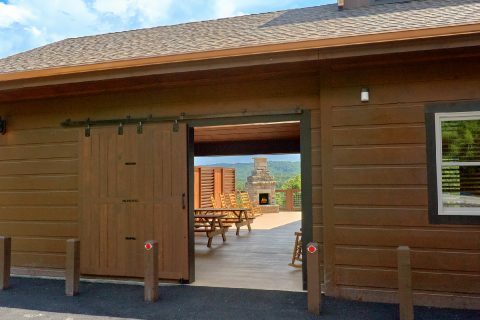 From this level, you can step outside onto a covered porch complete with rocking chairs and picnic tables for enjoying the stunning mountain view. 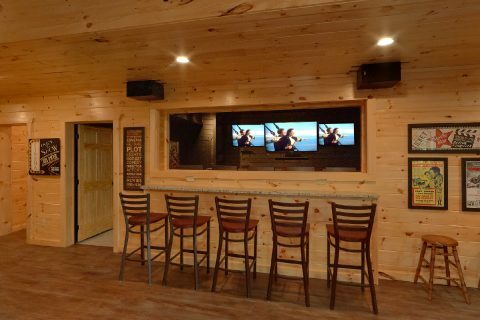 There's even a covered veranda that boasts a 60" flat-screen television and a bar area. 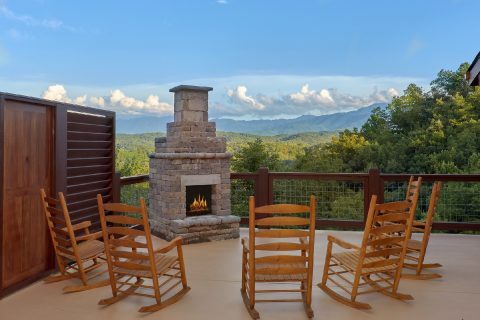 From the veranda, you can step out to a deck that comes complete with rocking chairs, picnic tables, and an outdoor wood-burning fireplace for enjoying an evening under a starry night's sky. 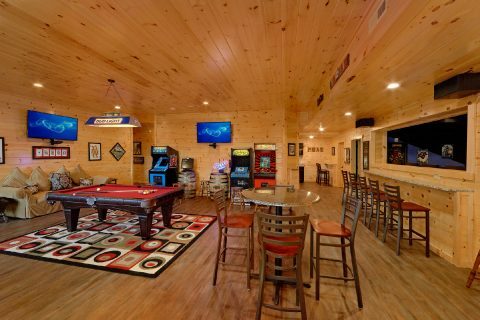 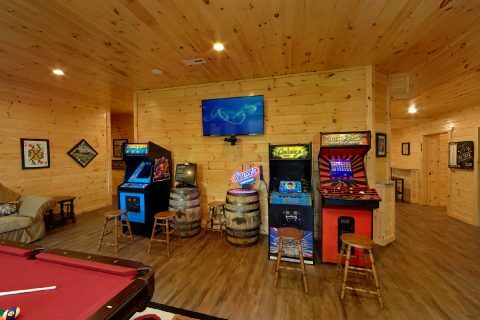 Downstairs, you'll find a game area complete with a pool table, arcade games, bar seating, and an extra refrigerator for keeping drinks and snacks handy. 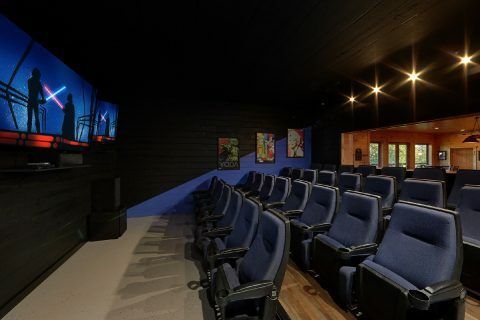 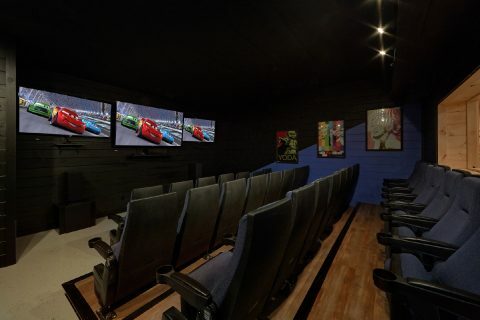 This level is also home to a large theater room with 30 theater-style seats and digital surround sound for watching your favorite movies in comfort and style. 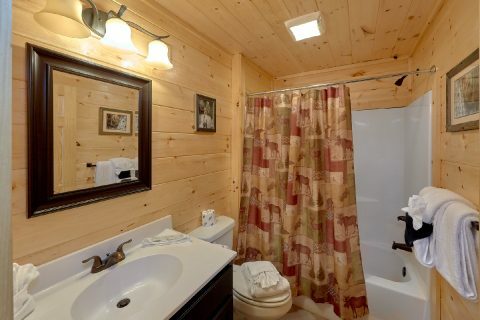 There's also a half bath on this floor for your convenience. 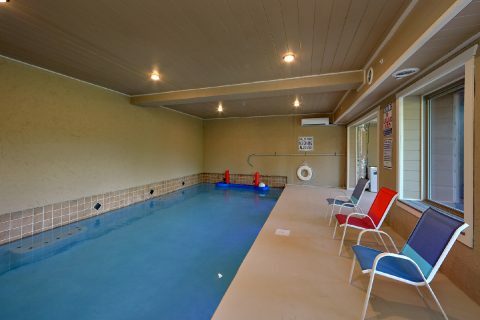 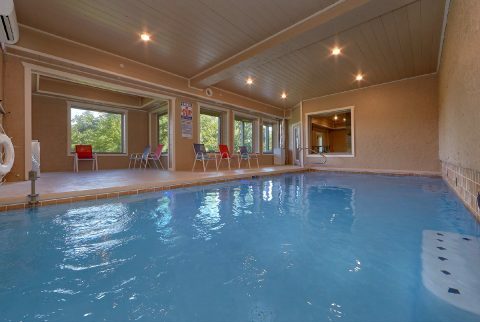 On the bottom floor, the large 15 x 32-foot indoor swimming pool is perfect for enjoying a relaxing swim any time of year! 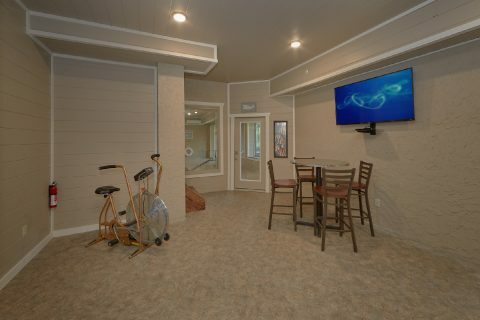 This level is also home to an exercise room that boasts a universal gym, a treadmill, and a chin-up bar, so you can stay in shape during your vacation! 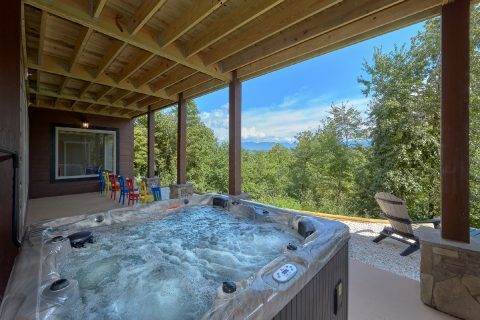 In a nearby outdoor area, there's also a year-round hot tub for taking a soothing dip in the great outdoors. 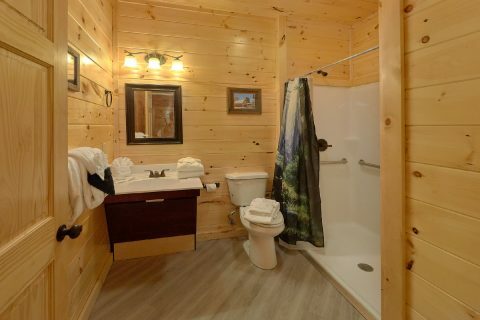 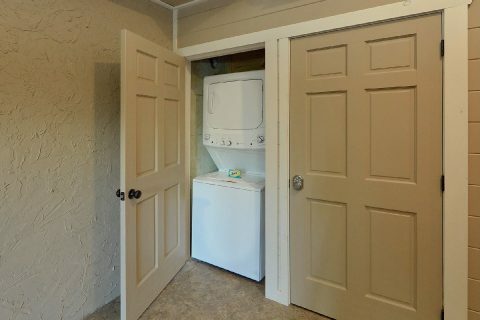 This floor is also equipped with a full bathroom. 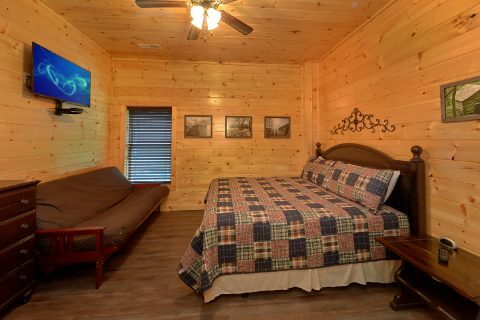 For staying well rested on your trip, this spacious group cabin offers plenty of space for your group to unwind. 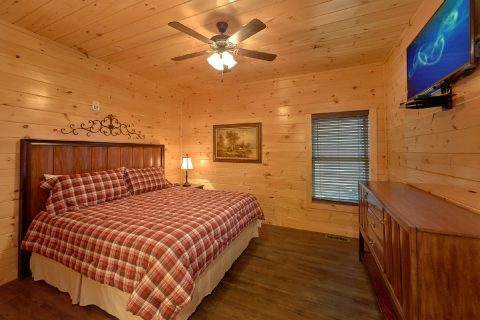 The main floor is home to 3 king-size bedrooms each with a full bathroom. 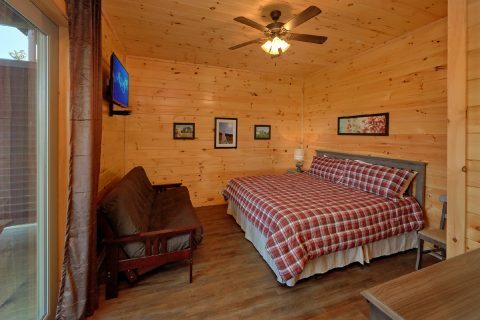 Two of these bedrooms provide futons, while the 3rd bedroom features a wheelchair accessible bath. 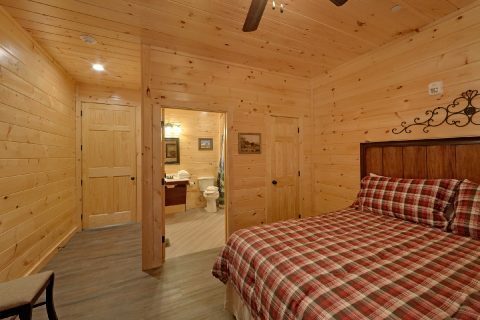 Upstairs, you'll find 5 king bedrooms with futons and full bathrooms. 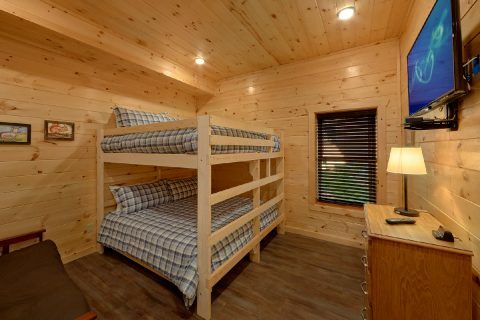 Lastly, the lower middle level comes with 6 king bedrooms with futons and full bathrooms and 2 bedrooms with king-size bunk beds. 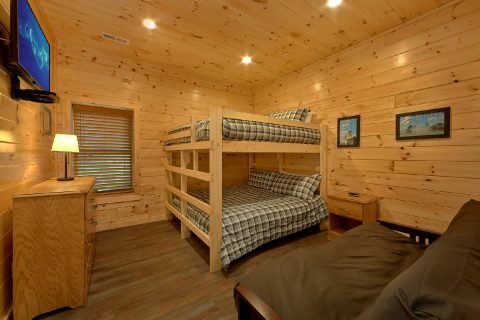 With 18 king beds and 14 futons, this extra large cabin can easily sleep up to 64 guests in comfort! 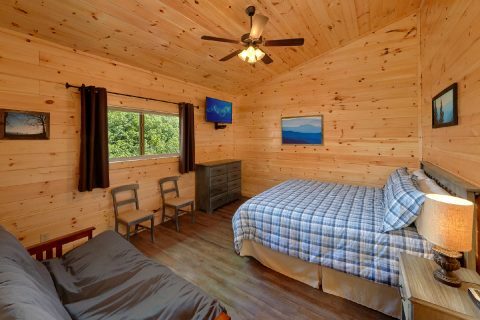 With practical amenities like a laundry room, WiFi Internet, and a large parking area that's large enough for full-size tour buses, this cabin has everything you need for your group vacation to be a success! 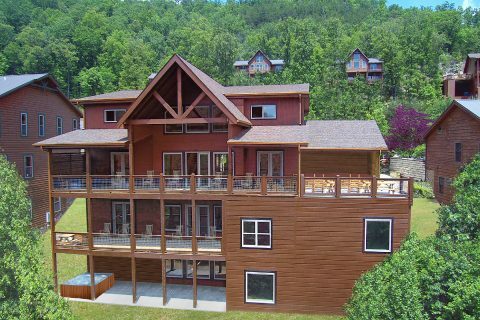 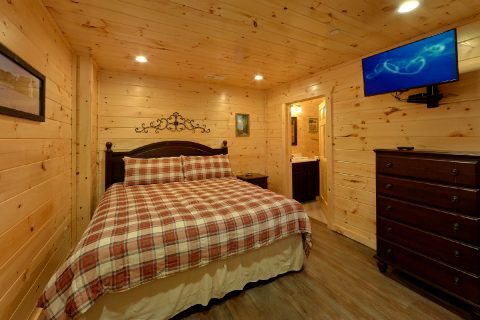 Best of all, you can save 15% on "Big Vista Lodge" when you reserve this cabin online with Cabins USA Gatlinburg. 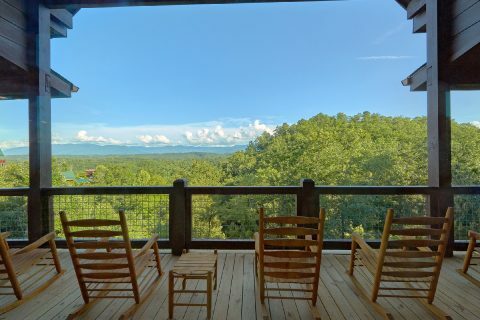 Book soon to save big on this excellent group cabin in the Smoky Mountains!